Place your preview message here. This will show in most email clients as the preview text in the inbox. Also, make sure it is long enough to take up all of the space available to your chosen email clients. Another cotton season is well and truly underway with production widely believed to be 4.6 million bales, a marked improvement on last season’s 3.8 million. Early indications of quality are encouraging and, for the most part, yields are also promising. The challenge now for the industry will be to move the cotton to export markets under some difficult market conditions. While grower prices have been attractive for the balance of the 2018 crop, well above $600, the rapid rise in price has left spinners in shock. Global cotton consumption has rebounded over the past twelve months, however while the USDA currently has it estimate at 122.9 million bales we shouldn’t lose sight of the fact that all we have done is get back to where consumption was at the time of the global financial crisis. That means we really are not regaining any market share as the world’s population has increased and logically so has the requirement for textiles. Cotton demand on the face of it does appear strong, particularly if you are selling USA cotton, however you must question what is selling. The USA had a strange 2017/18 crop production which was originally projected at 19 million bales but grew to 21 million bales. You would imagine this should have been negative for prices however that turned out to not be the case as the US produced a mixed quality crop that has actually helped them sell more and tighten the projected balance sheet. For a few months now, the weekly USA export sales reports have revealed excellent demand with strong sales to a wide range of markets that now total over 16.5 million bales (480 lbs) leaving everyone questioning the current USDA estimate of ending stocks at 4.7 million bales. Surely the position is much tighter than this? Rather than producing a high-grade crop Texas produced four million bales of low micronaire cotton and it is this “new product” that is capturing all the sales. Why? Because it is the cheapest cotton available and can be used by spinners all around the world, hence the demand from the wide range of markets and the great volume of sales. This cotton has to be sold, it is cheap and the four million bales only became available after December so that’s why we are seeing the sales, it’s not high grade premium cotton! Perhaps influenced by the above the cotton futures market has been confusing and leaving traders scratching their heads more times than not. It seems the market is just as much influenced by “outside” events as it is actual cotton market developments and this has produced some volatile movements in recent weeks. An ever-tightening US supply and demand situation is supportive of prices but then we get trade war concerns, actual war concerns, global financial concerns and a few Presidential “tweets” to give us plenty of risk on and risk off days, hence the volatility. Potential trade disputes between the USA and China could be the significant development, particularly if a threatened 25% import duty on US cotton into China comes into play. The ramifications of such a move could be very interesting to say the least. Bottom line is that prices appear well supported on cotton fundamentals but prone to outside developments that may not be that supportive. This time of year is typically a “weather” market as the Northern Hemisphere plants their new crops and this season the major attention once again is on the West Texas region. At the time of writing, conditions remain extremely dry in the world’s largest cotton patch and that concern is increasing as we enter the period of latest planting dates. The US is expected to increase planted area by nearly 7% this season but if it doesn’t rain in the next few weeks then production will be smaller than last season, potentially around 18 million bales which will make for some interesting trading. China, as always, is in the market discussion with plenty of rumours about what they are going to do with their import situation. Currently China is into its fourth month of Reserve stock sales and while the daily offtake was a little disappointing to start recent weeks have seen heavy demand and the daily offer of 30,000mt all being taken up. No doubt some speculative element has been at play because of the potential crop problems being experienced in Xinjiang but whichever way you look at it the supply and demand situation is getting tighter in China. Of course the big guessing game for everyone is when will China allow more imports than just their WTO required 894,000mt. It might be the second half of this year but most likely is 2019. In summary the coming few weeks promise some interesting trading conditions as we transition from current crop to new crop. The high level of July and December futures is making the sale of Australian 2018 crop difficult but we must hope that the spinner requires high quality premium cotton because at this point in the season Australia is the only place that has it until the end of this year. Mark your diary for Monday, August 6 for the ACSA golf and dinner event. Held in the run-up to the 2018 Australian Cotton Conference, our event this year will be held at the Gold Coast’s Emerald Lakes. A fun day is promised with players battling for the Hilton Lobb and Brett Austin trophies before concluding the day with a dinner at The Star’s Cucina Vivo. This promises to be a great event with plenty of international visitors in attendance. Our sincere thanks to event sponsors ANZ, AWH, Cargo Control Group, Chalmers, Cotton Compass, Namoi Logistics, NSW Ports, Port of Brisbane, Port of Melbourne, Port of Newcastle, Qube, Samuel Jackson, Toyoshima, TransGlobal Inspections, Wakefield Inspection Services and Yang Ming for supporting the day and the provision of prizes, facilities and refreshments. Our thanks also to AWH and Port of Melbourne for their sponsorship of the evening event. Click below for the nomination form and further information. Don’t delay – we already have 30+ players signed up. Enquiries to Tracey at secretariat@austcottonshippers.com.au or 07 3848 3823. Conference is shaping up to be a terrific event with an anticipated 2000+ delegates. 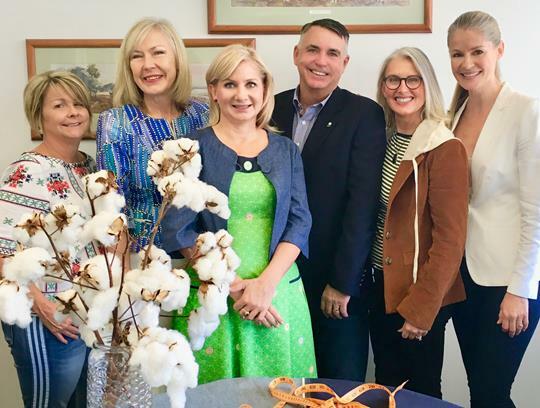 There is a really great vibe from the Australian cotton industry – delegates and exhibitors aplenty and we have good interest from the global community of buyers of Australian cotton. This same day will see delegates invited to don their favourite denim wear and ACSA’s fashion parade will have a denim focus. There is a great line-up of presenters over the three days. The ACSA Fashion Parade at Conference is set for a big change. The event this year will focus on everyone’s favourite wardrobe staple, denim. Staged on Wednesday, August 8 at 1.30 pm, the entire day of Conference which focuses on the end product that we produce, our customers and consumers will in fact have a real feel for denim with delegates encouraged to wear their favourite denim clothing. The fashion event will see Conference delegates treated to some fun and fabulous fashions for both men and women designed by Tengdahl, Maiocchi, PIA DU PRADAL and The Cloakroom. Square Textiles Ltd (Bangladesh) and Neela Blue (Pakistan) have very generously provided a range of denims to our designers. Neela Blue custom made for Conference a denim that is 99% Australian grown cotton and 1% stretch. Neela Denim by Sapphire Fibres in Pakistan is a state of the art, Gold Leeds certified, sustainable and responsible denim mill which is 100% vertically integrated, manufacturing bespoke products such as denim. Neela loves Australian cotton! Square Textiles has provided a range of coloured denims that are predominantly made of Australian cotton – every spinner’s fibre of choice. Square Textiles Ltd in Bangladesh are manufacturers of specialty yarns, textile and apparel and a significant buyer of Australian cotton. One of Bangladesh’s largest knitters and weavers, their business is vertically integrated, producing over 90,000 kgs of yarn every day. Square Textiles Managing Director, Mr Tapan Chowdhury is delighted to have the opportunity to showcase denim made with Australian cotton. Dig out your blue jeans or another denim favourite and join us on Wednesday, August 8 for our double-denim themed day. This is going to be something special so don’t miss the event during Wednesday lunch break and take the opportunity to meet the designers! Tracey Byrne-Morrison, Conference Secretariat; Deanne Mayocchi of Maiocchi; Julie Tengdahl of Tengdahl; ACSA Chairman Cliff White; Pia du Pradal of PIA DU PRADAL and fashion show producer Sharen Kenny with a sample of the denims. 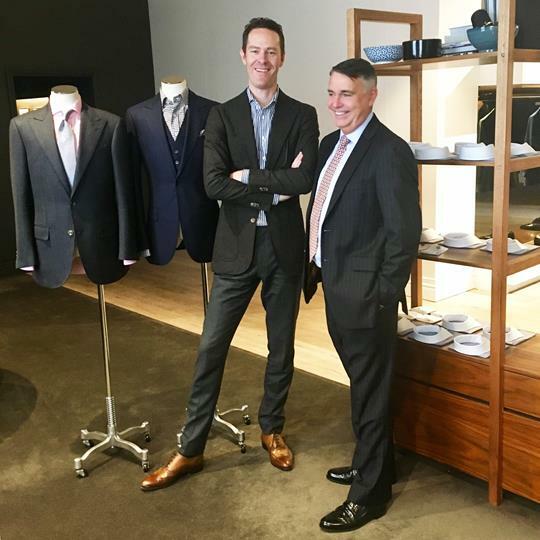 Andrew Byrne of The Cloakroom and Cliff White discuss cotton properties. 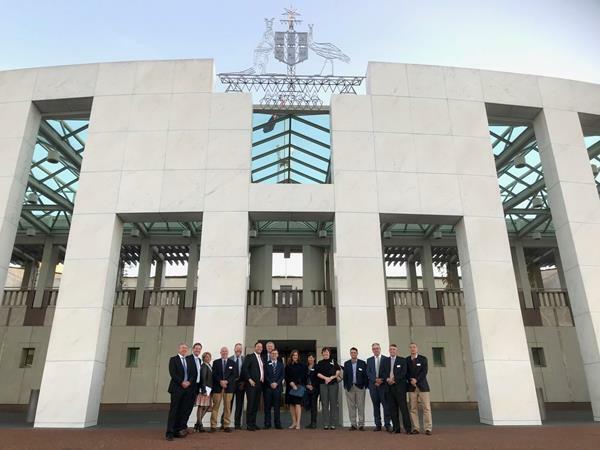 ACSA’s Board has just returned from a visit to Canberra – engaging with Commonwealth Ministers and various departments – updating them on issues and opportunities for the export of Australian cotton. It has been some time since ACSA held a Board meeting in Canberra but this one was worth the wait and the active involvement of a number of government bodies made for an interesting couple of days. We also had Adam Kay, CEO, Cotton Australia join us for a number of the meetings which was a benefit as Adam is well known in Canberra through all the work Cotton Australia does in the capital on behalf of the cotton industry. If you no longer wish to receive emails from ACSA you can unsubscribe here. Australian Cotton Shippers Association, PO Box 4 Annerley QLD 4103. © 2016 Australian Cotton Shippers Association. All rights reserved.